Gordon ‘Grumpy’ Spring was a goal-scoring machine for the New Westminster Salmonbellies and the best pure offensive player to wear the redshirt sweater during the pro lacrosse era. After he retired in 1921, he became a referee in the pro league – and then later became the manager of the New Westminster Salmonbellies during the years of the Great Depression and Second World War before he passed away in 1949 at the age of 60. From 1909 to 1921, Spring played in 134 pro games on the Pacific Coast, scoring 191 goals and accumulating 34 penalties for 181 penalty minutes. In two of those seasons, he led all players in goal scoring – in 1912 with 29 goals and then 1915 with 23 goals. His lone senior appearance occurred during the infamous gunshot riot of 1908. 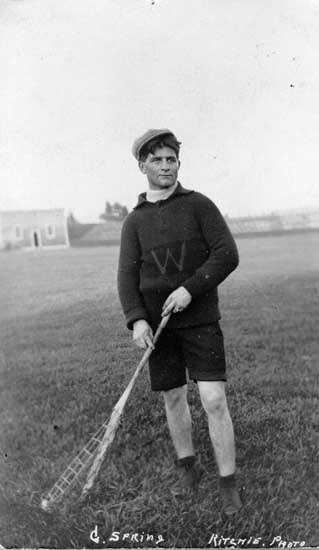 Although a member of the 1908 team, he did not accompany the Salmonbellies back east in their Minto Cup challenge on account of his age and the cost of the trip. Gordon Spring played the inside home position whose role in field lacrosse back then was simple: score goals. And with that task, ‘Grumpy’ Spring excelled very well indeed. Spring’s typical play was to set himself up in a starting position between fifteen and twenty feet behind and the same distance to the side of the net outside the opposing goalkeeper’s forward line of sight. ‘Grumpy’ would then drive around and cut across the front of the net. He used a sawed off stick which he kept tucked close to him, making it difficult for his check to dislodge and defend against as the feeding pass to Spring came hurtling in. With one quick shot, timed for the incoming pass, he’d fire the ball over the keeper’s shoulder. 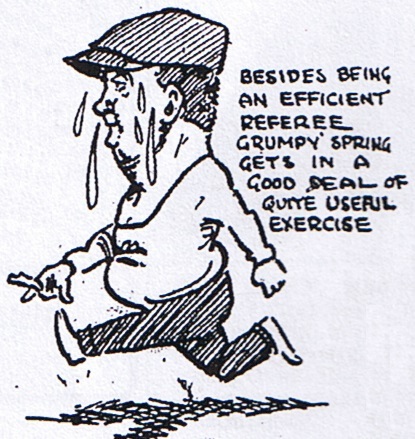 ‘Grumpy’ was broad and heavy and not a fast runner, but so long as he was fed a good pass right at his body and the waiting pocket – and not above or off to his side where he would have to then expose his stick – he could execute his signature move from start to finish in but a few seconds, catching the keeper unaware of his attacking run until it was too late to re-act. As an early pioneer of the one-timer, it was a play he ran countless times to perfection. His best scoring output occurred on August 20, 1909 when he shell-shocked Vancouver goalkeeper Dave Gibbons for 5 goals – including a third-quarter hat-trick. In six other games he bagged 4 goals and he chalked up 20 games with hat-trick. With a total of 27 games under his belt with 3 or more goals scored to his name, ‘Grumpy’ Spring held a 7-game advantage in hat-tricks (or better) over his nearest challengers in Édouard ‘Newsy’ Lalonde and his brother Cliff Spring. Despite being the greatest scoring player on the Coast during the heyday of the field era, his later accomplishments as a manager in the game were even more legendary and which ultimately secured ‘Grumpy’ Spring a place in the Canadian Lacrosse Hall of Fame in 1966 as a Builder. He was manager of the New Westminster Salmonbellies when the team participated in the 1932 Olympic Games held in Los Angeles, where lacrosse was a demonstration sport. He won two Mann Cups with the team in 1937 and 1943. When he passed away on September 21, 1949, the news made the front page of the New Westminster Columbian newspaper as tributes showered in. “Lacrosse has lost its best friend and no fair-weather friend at that. He stayed with the game when it was at its lowest ebb, and loved it” stated the longtime New Westminster parks board chairman and lacrosse supporter Dan McKenzie. “I used to get a bigger kick out of the game when we had to pass the hat around in order to meet the bills, than now when money seems to be the main object” Grumpy was quoted as saying to McKenzie not long prior to his passing. Gordon Spring was born in Bracebridge, Ontario (modern District of Muskoka) and moved west with his parents at the age of eight. Outside of lacrosse, ‘Grumpy’ worked as a plumber under the partnership firm name of Spring & Sybley for 35 years.